Saturday December 6th was a great day for fans at the Texas Sports Hall of Fame’s Lone Star Tailgate preceding the Baylor/Kansas State game at nearby McLane Stadium. Besides hearing live music and downing tasty barbeque, fans were treated to an opportunity to meet Baylor and NFL legend Cotton Davidson. Cotton graciously greeted fans, including the rival Kansas State fans who sauntered in. He spun stories of his outstanding 12-year pro football career. Originally a first-round draft choice of the Baltimore Colts in 1954, Cotton lost his opportunity to be the Colts franchise quarterback before the 1955 season when the U.S. Army drafted him. Cotton claimed he didn’t do much in the service other than play football and baseball. While Cotton marshalled Uncle Sam’s football squads, the Colts signed Johnny Unitas. Before Cotton returned to the Colts, Unitas cemented himself as a NFL star. Can you imagine Andrew Luck or Johnny Manziel drafted into military duty while the Colts and Browns found superstar quarterbacks, closing down their opportunities? Such was the scenario between Davidson and Unitas. Cotton and Johnny U became roommates and good friends, and Cotton speaks nothing but praise for Unitas both as a quarterback and a person. Lamar Hunt signed Cotton in 1960 to quarterback Hunt’s new startup – the Dallas Texans of the American Football League. Cotton played two seasons in Dallas before being traded to the Oakland Raiders. He and Tom Flores split time as the Raiders starting quarterback for several seasons, Cotton’s career came to a close in training camp entering the 1968 season, as a teammate injured Cotton’s shoulder. The Raiders subsequently traded for Daryle Lamonica, and Cotton’s career came to a close. 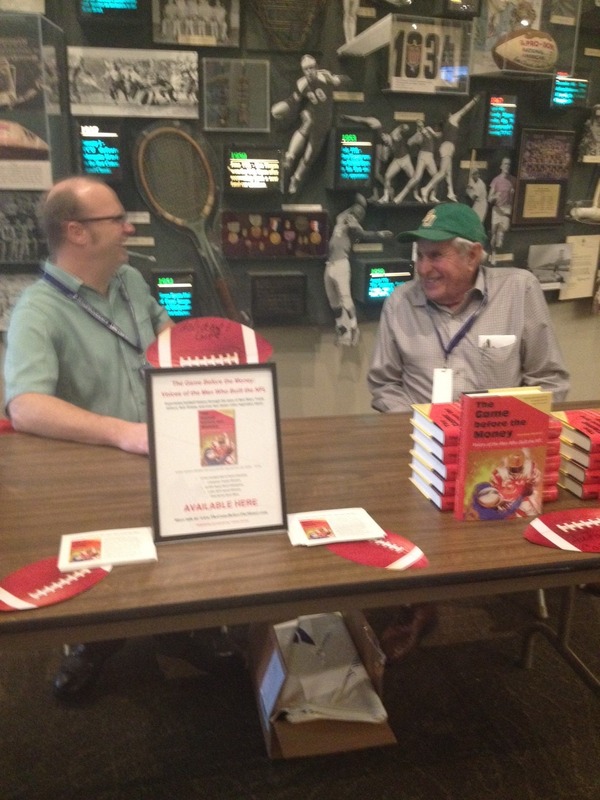 An added surprise to Saturday’s fun was the presence of Louie Kelcher’s junior high school football coach. He spun a yarn about teaching Kelcher the importance of pressing on and refusing to quit. “Quit’s the worst word in the English language,” he said. He also noted that if you quit once, you’re in danger of turning quitting into a habit. On Thursday, December 11, we were in Houston, Texas with Oiler greats Elvin Bethea and Garland Boyette. They traded stories about the old days and signed copies of The Game Before the Money: Voices of the Men Who Built the NFL. We’ll recall that event in our next post.